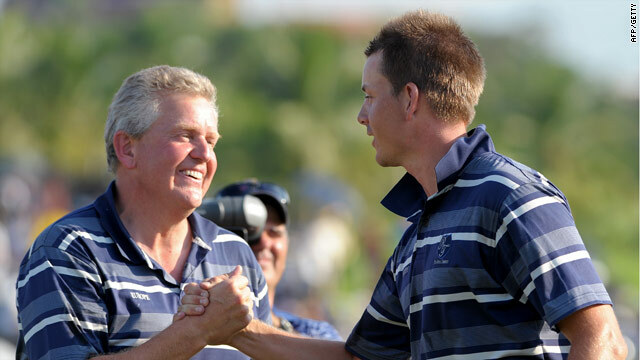 Europe captain Montgomerie (left) congratulates Stenson on his clinching half in Bangkok. (CNN) -- Europe regained the Royal Trophy from Asia as world number seven Henrik Stenson clinched a dramatic victory by holing an seven-foot par putt on the 18th to halve his match with Thailand's Thongchai Jaidee. The Swede's battling half point from three down after 10 against Jaidee was enough to give Europe an 8 1/2 to 7 1/2 victory. Had Stenson missed the putt, the annual team competition would have finished tied with Asia retaining the trophy they won for the first time last year. "I am not playing great at the moment but I told the boys I could find that extra bit near the end if I needed it and I did that today," Stenson told gathered reporters after the thrilling finish to the final match on course. Player-captain Colin Montgomerie, who will also take charge of the European team at this year's Ryder Cup, was delighted by his team's efforts after trailing on the first day. Monty also showed his fighting qualities in matchplay to claim a crucial half point on the final day singles against Liang Wen-chong of China. "This is a great start for European golf in a very important year and all credit to my team for fighting so hard for the victory." The Scot also paid tribute to ailing Spaniard Seve Ballesteros, who was the creator of the tournament which started back in 2006. "Seve phoned me and congratulated me when I was on the 18th green," he revealed. Japan's Koumei Oda again starred for Asia as he scored an easy 5 and 3 victory over Sweden's Alexander Noren, who had a perfect record going into the singles. Korea's Charlie Wi also boosted Asia with a tight 1-up win over England's Simon Dyson, but a fine win for Sweden's Peter Hanson over Ryo Ishikawa of Japan 5 and 4 gave Europe, who had started with a one-point lead overnight, some respite. India's Jeev Milkha Singh tilted the advantage back to Asia with a 2 and 1 win over the previously unbeaten Robert Karlsson of Sweden. But Spain's Pablo Martin and Soren Kjeldsen of Denmark secured victories for Europe over Thailand's Prayad Marksaeng and India's Gaganjeet Bullar respectively to set the scene for Stenson. Meanwhile, Charl Schwartzel claimed his fourth European Tour title today after a final round six-under 67 secured a one-stroke win at the Africa Open title in East London. The South African shrugged off a last-hole bogey for a total of 272 - 20 under par overall to edge out co-overnight leader Thomas Aiken by a stroke. Aiken, who missed a chance on the 19th to force a playoff, finished with a 70 with another South African Jbe' Kruger in third. On the PGA Tour, Lucas Glover continued to lead going into the final round of the season-opening event, the SBS Championship in Hawaii. The reigning U.S. Open champion has a one-shot advantage over defending champion Geoff Ogilvy of Australia as he carded a two-under 71 for a 17-under aggregate of 202 at Kapalua Resort Plantation Course. Scotland's relatively unknown Martin Laird is a further shot back after a 69 in the 28-strong event for winners on the PGA Tour last season.